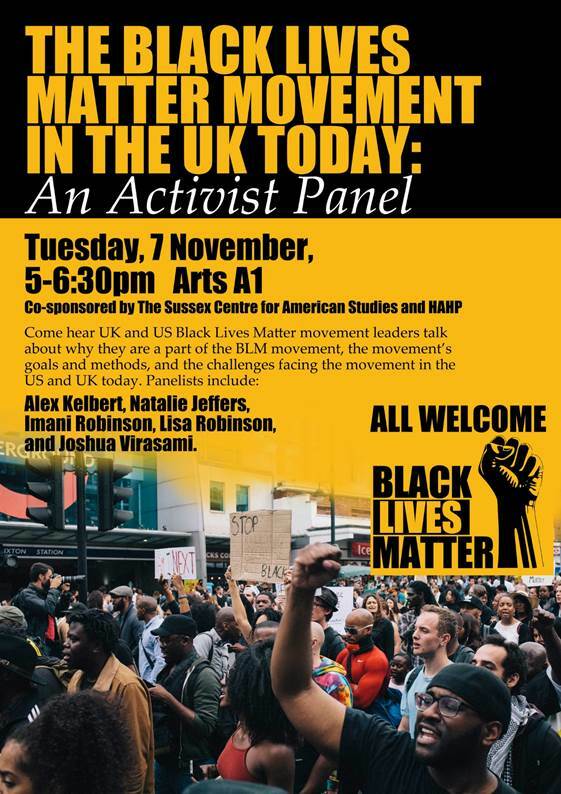 A panel featuring leaders of the UK and US branches of Black Lives Matter are coming to campus on Tuesday 7th November. The Sussex Centre for America Studies and the School of History, Art History and Philosophy (HAHP) are sponsoring the panel event, which takes place from 5-6:30pm in the Arts A1 auditorium. The speakers include Alex Kelbert, Natalie Jeffers, Imani Robinson, Lisa Robinson, and Joshua Virasami. The event is designed to allow them to give a first-hand account of why they’re involved with the group, the overall goals and aims of the movement, and the challenges facing them in the US and UK today. The activists will also take questions during the second half of the talk. Dr. Melissa Milewski is a principal organiser of the event, and a specialist in American Civil Rights movement. She is also working on a new book, examining the methods used by people of colour in protesting their treatment by the legal system, including the courts and police. Dr. Milewski told The Badger: “We’re very excited that several of the leaders of the UK Black Lives Matter movement will be coming to campus”.